Growth stocks, especially in the tech sector, have dominated this bull market’s gains, leaving value investors wondering when their own resurgence is coming. As the ongoing bull market matured, high-growth companies like Amazon and Facebook stole the spotlight from value stocks — or those that were cheaper based on metrics like price-earnings ratio. Investors could simply have bought these growth stocks, closed their eyes, and reaped some of the most bountiful returns of this cycle. Big tech has faltered of late, however, as investors worry that regulators are coming to prune their growth, which by itself is showing signs of peaking. This means value stocks may fall into favor again as investors seek alternatives, according to Andrew Lapthorne, the head of equity quantitative research at Societe Generale. „Given the increasing bearish mood of global markets and the historically low current valuations of the value strategy after long periods of underperformance, conditions appear to be ripe for the long-awaited value resurgence,“ Lapthorne said in a note. Conventional wisdom suggests that value stocks work best during the early stages of an economic cycle. That’s because investors scarred by the preceding crash become more discerning of valuations and suss out discounts. It further holds that value stocks suffer during downturns as consumer demand falters. Lapthorne concluded that there’s more to value than these widely held assumptions. His study of their performance dating back to the 1920s indicates that value is often a resilient factor during episodes of market volatility. Furthermore, he observed that events associated with their outperformance often overlap with periods when risk assets and strategies underperform. The chart below illustrates how value’s performance stacked up next to the S&P 500 when the broader index fell by more than 10%. On the face of it, value stocks had a mixed track record. They sank with the broader market, went negative during 11 of the 24 episodes, and remained positive during 10 of them. But Lapthorne’s closer examination produced two key findings. First, value rallies were stronger than the worst value downturns, with the dotcom bubble and 1980s inflation crisis among the blowout episodes. 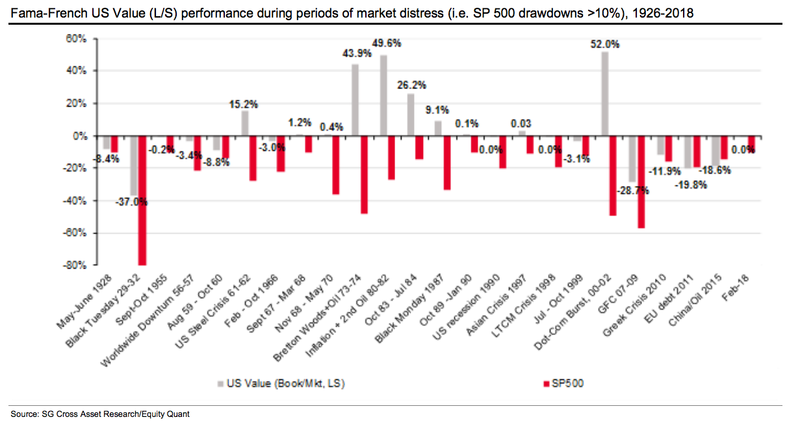 Secondly, the average value performance across these events was a -2.9% annualized drawdown, versus a 30% slump for the S&P 500. Relatedly, the average performance of value stocks was 2.4% per episode, compared to -25% for the S&P 500. Even nine-plus years into this historic bull market, it’s still any investor’s guess when exactly the next crash will happen, although many think it will be sooner rather than later. It’s also uncertain whether (or by how much) value stocks will outperform the broader market in the next downturn. Lapthorne’s message despite this uncertainty is that value has proven to be a hedge during regime shifts from low volatility to high volatility. „The preponderance of our extensive research supports a robust value strategy to be more global than regional, neutral with respect to sector/industry exposures, but flexible with respect to country tilts, and prefers size weightings to capitalizations,“ Lapthorne said.